Our range of Marble Inlaid Dining Table make any ordinary table look extremely appealing. Each of our Inlay Table Top is prepared with perfection and dedication. We offer these Marble Dining Table Tops in various designs, sizes and colors as to fulfill the need of our valuable client. We offer these at reasonable prices with long lasting shine and durability. Word fail to describe the beauty if this Dining stone Marble Table Top. 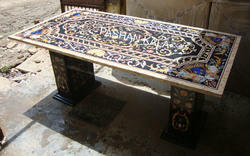 This table is decorated with beautiful motifs, inlaid in black stones. We are involved in manufacturing and exporting wide range of Black Marble Table Top. These are fabricated using best quality marble and available in broad spectrum. Our skilled craftsmen have carved it so beautifully to add a royal looks. Our range of Marble Stone Inlaid Dining Table Top make any ordinary table look extremely appealing. Each of our Inlay Table Top is prepared with perfection and dedication. We offer these Marble Dining Table Tops in various designs, sizes and colors as to fulfill the need of our valuable client. We offer these at reasonable prices with long lasting shine and durability. Looking for Stone Inlaid Dining Table ?